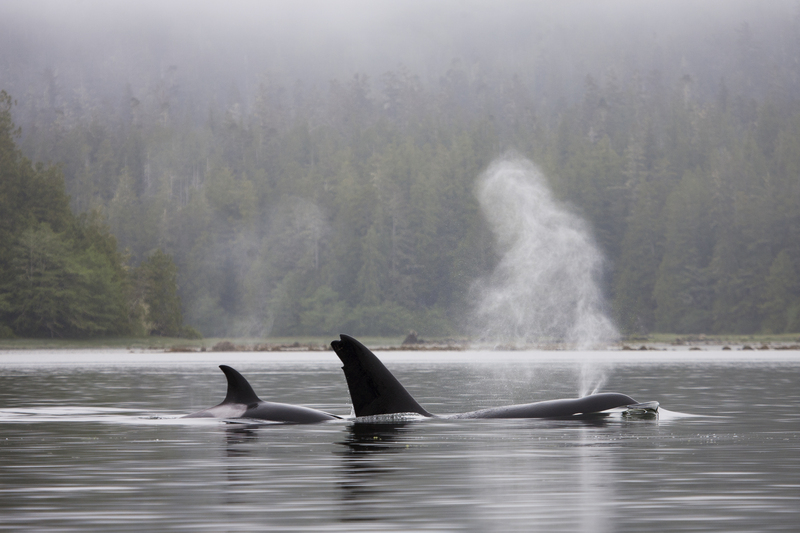 If you’re looking for an adventurous family vacation immersed in nature, Tofino should be on your list. This small community on the West side of Vancouver Island, in the province of British Columbia, Canada, offers striking scenery, active adventures and a hip atmosphere that should delight even hard-to-please teenagers. 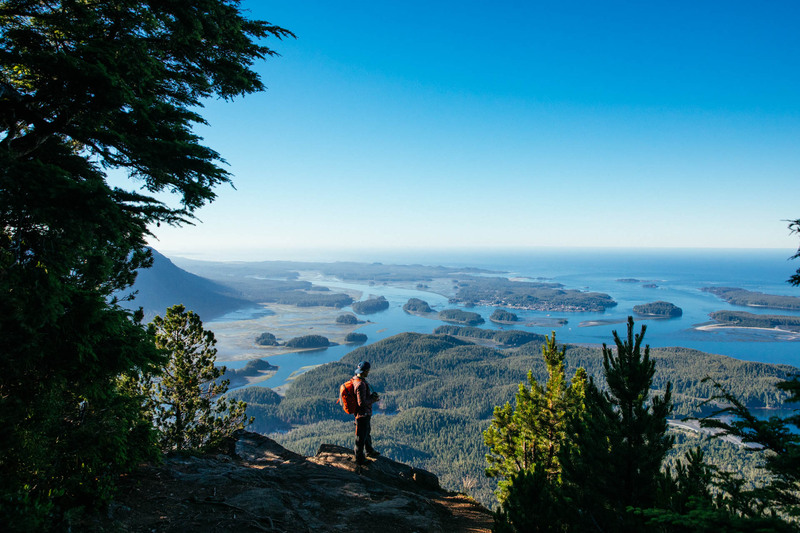 It is not easy to reach Tofino, but its remoteness is part of the experience. You may catch a small plane in Vancouver that gets you to Tofino in under an hour. To really get a deeper island immersion, ride the ferry from Vancouver or Washington State to Victoria. After you’ve explored this gorgeous small city, drive approximately 5 hours across the island to Tofino. Once you arrive, you’ll feel like you’re on earth’s edge because you pretty much are. Vancouver Island adventures are more about the water than the land, and Tofino’s pristine beaches beckon you to get wet. Surfing rules in laid-back Tofino. Canadian Prime Minister Trudeau and his family spent their summer holiday surfing its coastline, so it has the political seal of approval. The authentic surfer vibe feels straight out of a Beach Boys song, minus the California heat. The surf culture emerged in the 1960s, when counter-culture youth were drawn to Tofino’s wilderness beauty, reliable swells and genuine sense of community. Long Beach, Cox Bay and Chesterman Beach are considered the best surfing spots. There are several respected surf schools in town, including Pacific Surf School. You’ll need a wet suit as the water temperature ranges from chilly to frigid year-round, but all schools and surf shops rent them. The cold Pacific waters are brimming with fish. Chinook salmon, halibut and lingcod are plentiful. 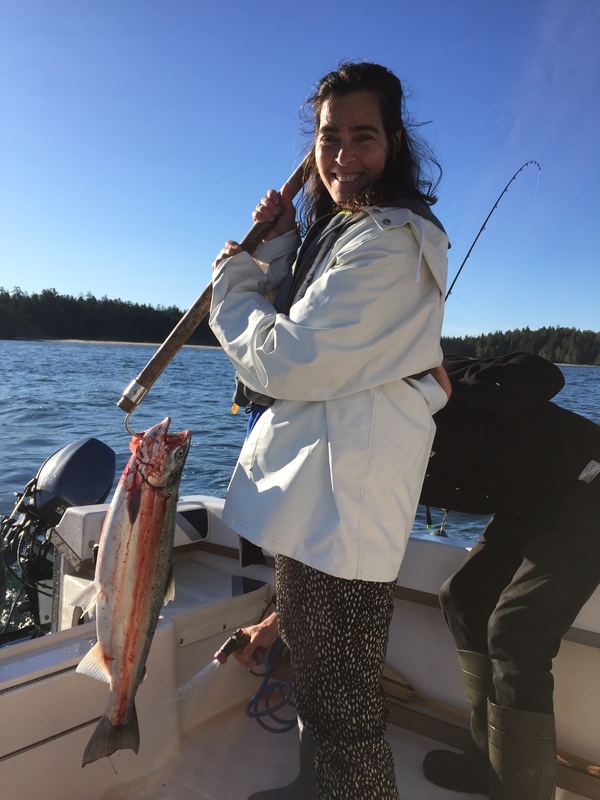 We booked a morning fishing excursion at the Tofino Resort + Marina’s Adventure Centre. As a first-timer, I didn’t expect to catch anything, but beginner’s luck had me reeling in a 12-pound Chinook salmon. Even if you don’t catch a fish, you’re likely to see orcas, grey and humpback whales, seas lions and more. 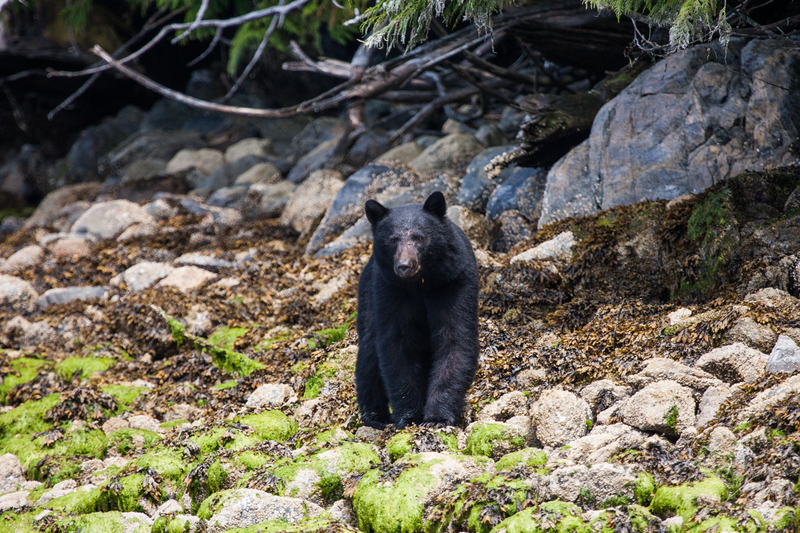 We saw black bears frolicking on the nearby shore and a wolf treading water as we patiently waited for the fish to take the bait. Pedaling the designated bike path is a great way to traverse this flat town. Bicycle Marc is the friendly owner of Tof Cycles. He delivers bikes, helmets and maps to your door and offers kid-size bikes plus excellent service. My tire blew out and he brought me a replacement bike within 10 minutes. After surfing, fishing or biking, sore muscles crave relaxation. 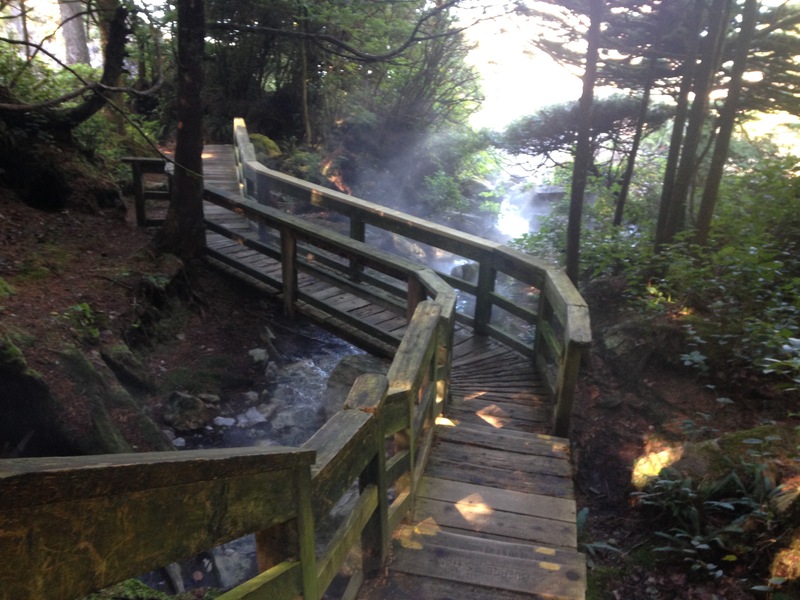 Tofino’s solution is Hot Springs Cove. Catch a boat to the springs and you’ll be there in an hour. Once you moor, you’ll stroll the wooden boardwalk for 30 minutes through old-growth forests. You’ll arrive at a natural hot tub allows where you may soak in geothermal mineral pools, complete with waterfalls cascading toasty droplets on your head. As you relax in the pools, you’ll have a front-row view of the Pacific Ocean. There are changing rooms and bathrooms — called washrooms in Canada — but no food, so bring a snack. If you’re an ice hockey fan or simply Canadian, you’re already acquainted with two-time Stanley Cup winner Willie Mitchell. 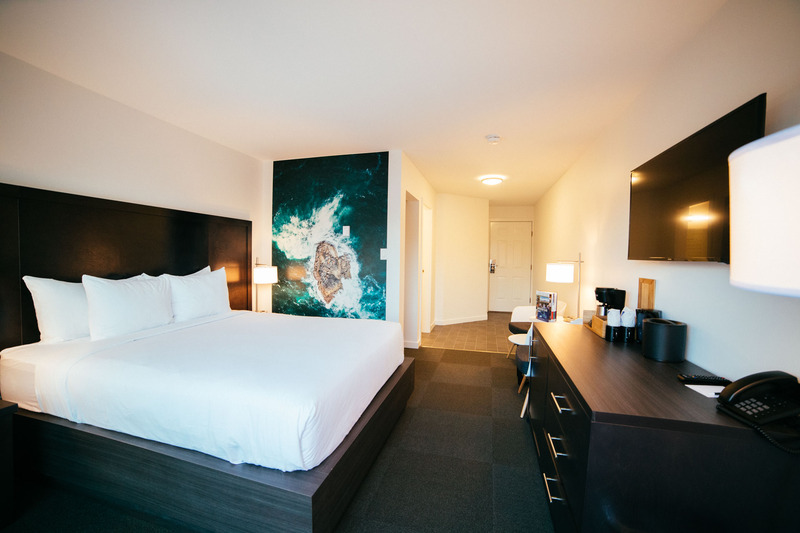 Mitchell is originally from Vancouver Island and after an illustrious NHL career, he has returned to his roots to open a new hotel, the Tofino Resort + Marina. Mitchell is hands-on in his new role as hotelier and seems born to welcome visitors to this magical part of the world. The 62 spacious rooms are an excellent choice for families. The feel is uncluttered but by no means Spartan. Amenities include over-sized beds and balconies with sea and forest views. Everything is functional and sensible, from the coffee maker to the hairdryer to flat screen television. Several rooms have a separate living room with a pullout couch and second television, so families can really spread out. 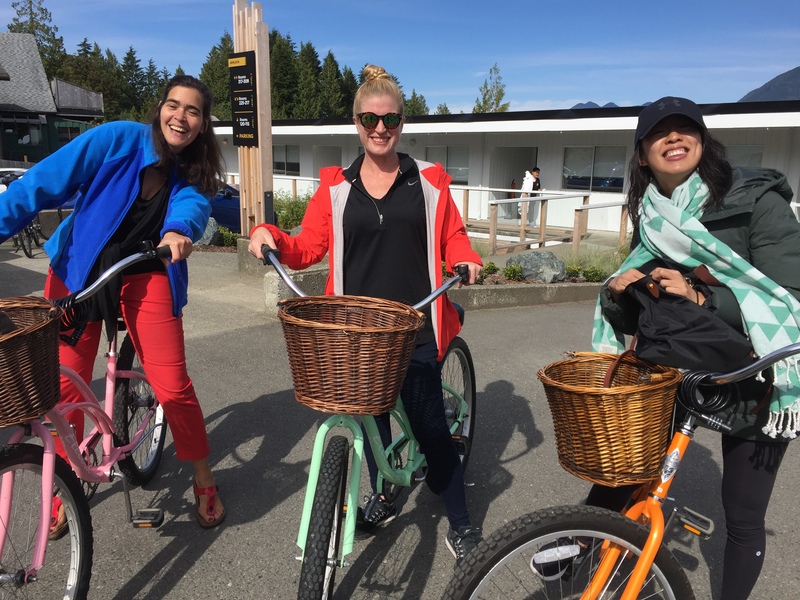 As the only marina-front hotel in Tofino, the location is a winner, walking distance from the town’s boutiques, surf shops and dining. The have standup paddleboards for guests to borrow and bikes for rent. They’ll even lend rain slickers and umbrellas if it rains — and it will! If you’re seeking active adventures, the onsite Adventure Centre is ground zero for family fun. It’s very convenient to have options like whale watching, fishing and excursions to Hot Springs Cove only steps from your room. For a small community, Tofino offers a wealth of dining options. 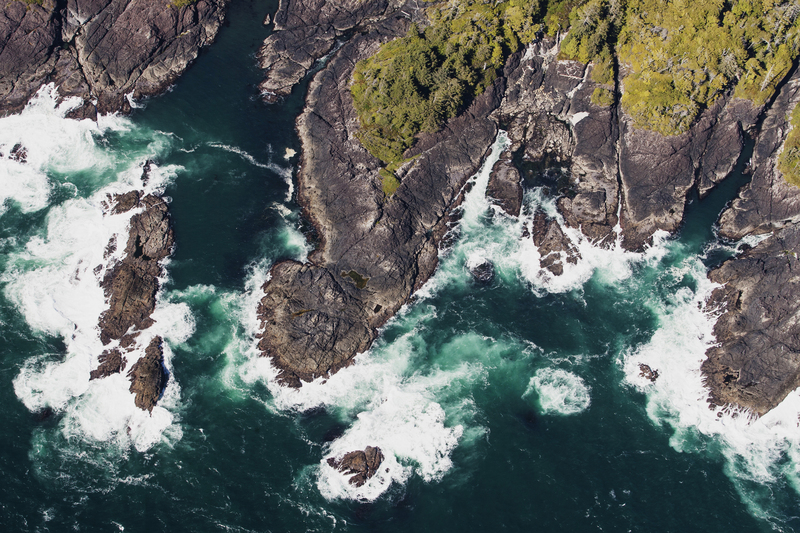 With an abundance of natural beauty, picnics and Tofino go together like milk and cookies. Picnic Charcuterie is the place to purchase your provisions. Owner Tina Windsor is a one of several young female residents who are adding plenty of zip to the local food and drink scene. Her pocket-sized shop features fine cured meats, a vast selection of Canadian cheeses and fresh-baked breads. Each morsel is ethically crafted with a premium placed on sustainable methods and ingredients. If you’re seeking a gourmet beachside feast, don’t miss it. 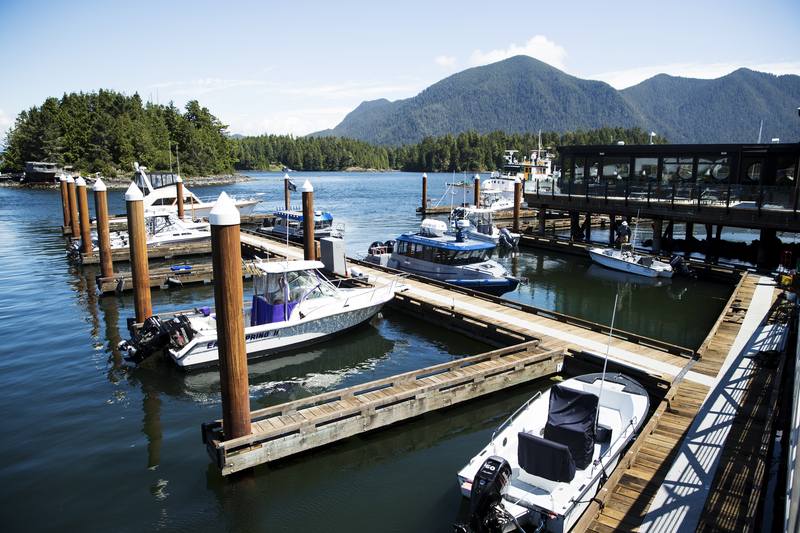 The Tofino Resort + Marina offers two onsite restaurants, both with sweeping views. The Hatch Waterfront Pub is a causal dining experience. The made-in-Italy pizza oven cooks each thin-crusted pizza to perfection. The open kitchen allows for watching the cooking action, so the kids may enjoy seeing their pizza being tossed high in the air. Additional kid-friendly options include panko-crusted lingcod with house-cut fries and an organic burger on a house-made bun. Also onsite is 1909 Kitchen. Its décor is stylish, with exposed beam and metal design elements, while the vibe is comfortable and welcoming. The chef-driven menu reflects Chef Paul Moran’s passion for capturing the clean, fresh flavors found in Tofino’s pure water and unblemished forests. The menu features freshly foraged ingredients such a mushrooms and sea chives as well as just-caught fish and ethically raised meats. 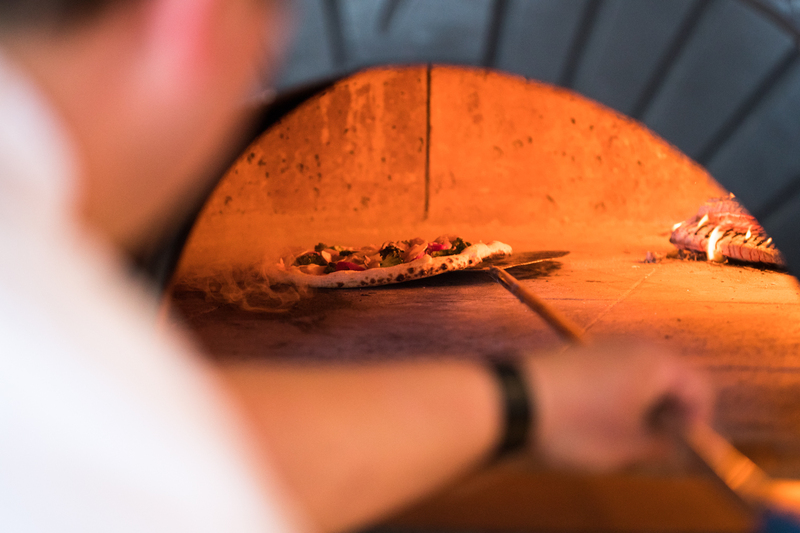 Delectable homemade bread is cooked in the wood-fired pizza oven. My family never passes up the chance to sample sweet treats. 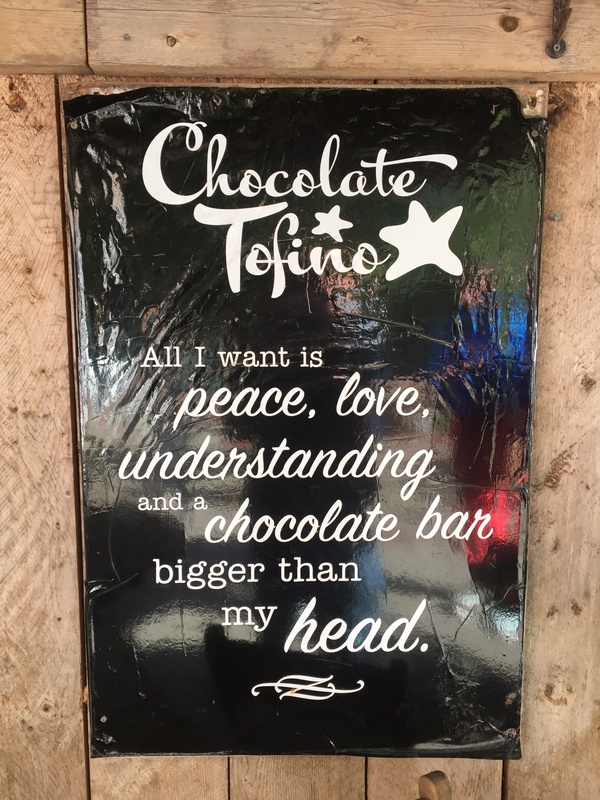 The ice cream and chocolates are truly scrumptious at Chocolate Tofino, where the confections are handmade without any artificial ingredients. Organic ingredients are used in their house-churned gelato and ice cream. 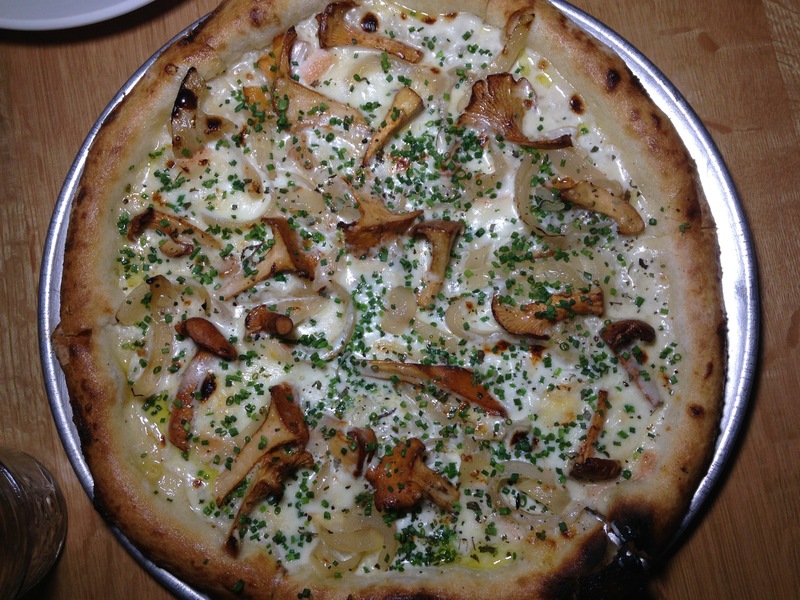 Everything is made fresh daily, on-premise. Instead of regularly seating, the shop is furnished with seats from a movie theater, something my cinephile family adored. Tofino shines in spring, summer and fall. Of course, it rains often here so bring a raincoat and umbrella. Locals don’t allow the precipitation to deter them. Don’t count out a winter visit. Storm watching is growing in popularity and surfers anxiously anticipate winter storms that often bring big swells.